Slàinte is a Gaelic word meaning "health" or, more popularly, "cheers/skål". 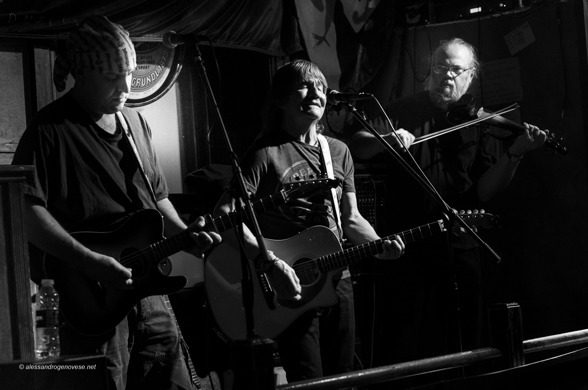 The group Slàinte began life in Sweden in the early 1990's as Billy and the Boys and the founder Billy Jones has worked since then in a changing constellation of excellent musicians. With himself and Jonas Liljeström on fiddle, the band is now basically a duo which can be augmented, depending on the venue, with banjo, guitar, mandolin, accordion, percussion and/or drums. Their latest in a series of records, “Roy on the Hill” features Billy's own songs with this line-up, as well as duo pieces. The musical style is based on Celtic and American folk, roots music - played with a rocky beat and always with feeling. They have performed three times, with great success, at the prestigious Edinburgh Festival. Guitarist, singer, songwriter Billy Jones began playing in rock/pop bands in the early 1960's. Born in Edinburgh, he grew up nearby in Bathgate, a small town in the Scottish Lowlands where as young teenager he worked with various school bands. At university and afterwards he continued playing rockabilly, rock'n'roll and blues - then, as his musical tastes widened, Celtic roots and American folk/country music. After years and thousands of gigs throughout Europe and the USA, several LP's, singles and cd's, he moved to Sweden. Resident there, he has established himself as a worker in song - recording original material and playing countless numbers of shows in Scandinavia and of course back home in Scotland. Jonas Liljeström (fiddle) was born in Kungälv on the west coast of Sweden in 1973. He grew up in a music-loving family and learned to appreciate various folk music traditions at an early age, and in the early 90s he started playing the fiddle on a professional level. He has played in bands with widely different musical orientations over the years, and also participated in the organising of the annual Irish cultural festival ”Gothenburg Irish Festival” in the late 1990s. He is proficient in many different musical styles, including Nordic, British and Irish folk music, jazz, blues, bluegrass, klezmer and various kinds of East European folk music. Apart from Slàinte, Jonas is also a member of the folk/world music bands Krilja and Salamander. He is also a PhD student of ethnomusicology at Gothenburg University, Sweden. Slàinte's basic lineup is a duo but the band can be augmented with other musicians. From the left: Teddy Kaiser, Billy Jones and Jonas Liljeström. Are you interested in booking us for a concert? In that case, feel free to contact us by emailing billyatkinson69@hotmail.com or phoning +46 739 87 77 89. You can also reach us by emailing jonasliljestrom@hotmail.com or phoning +46 706 27 27 45. The cost is negotiable; please contact us to get an estimate!